Acrylics - 28" x 18"
The quickest way to grab a potential reader's attention is to cause a question in their mind - is the dragon saving the woman or about to have her for lunch? 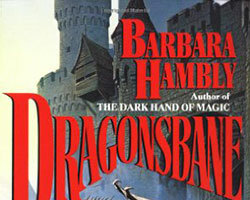 Originally done for the cover for the novel by Barbara Hambly, but a very popular dragon image in its own right. 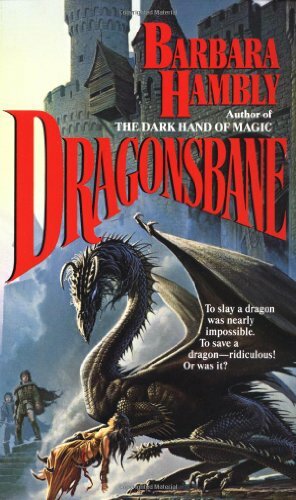 When the Black Dragon seized the Deep of Ylferdun, young Gareth braved the far Winterlands to find John Aversin, Dragonsbane -- the only living man ever to slay a dragon. In return for the promise of the King to send help to the Winterlands, Aversin agreed to attempt the nearly impossible feat again. With them, to guard them on the haunted trip south, went Jenny Waynest, a half-taught sorceress and mother of Aversin's sons. But at the decadent Court, nothing was as expected. Rebellion threatened the land. Zyerne, a sorceress of seemingly unlimited power, held the King under an evil spell, and he refused to see them. Meantime, the dragon fed well on the knights who had challenged him. 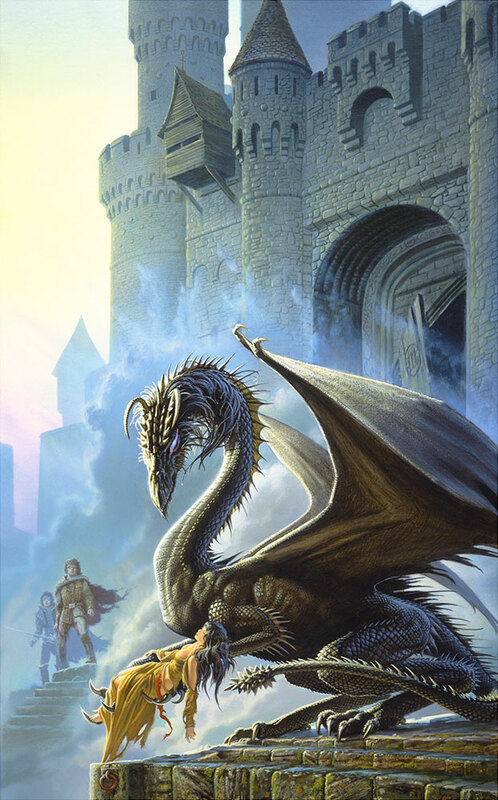 In the end, Aversin, Jenny, and Gareth had to steal away at night to challenge Morkeleb, largest and wisest of dragons. But that was only the beginning of the perils they must face.